Looking for a fun and educational way to be entertained this winter? 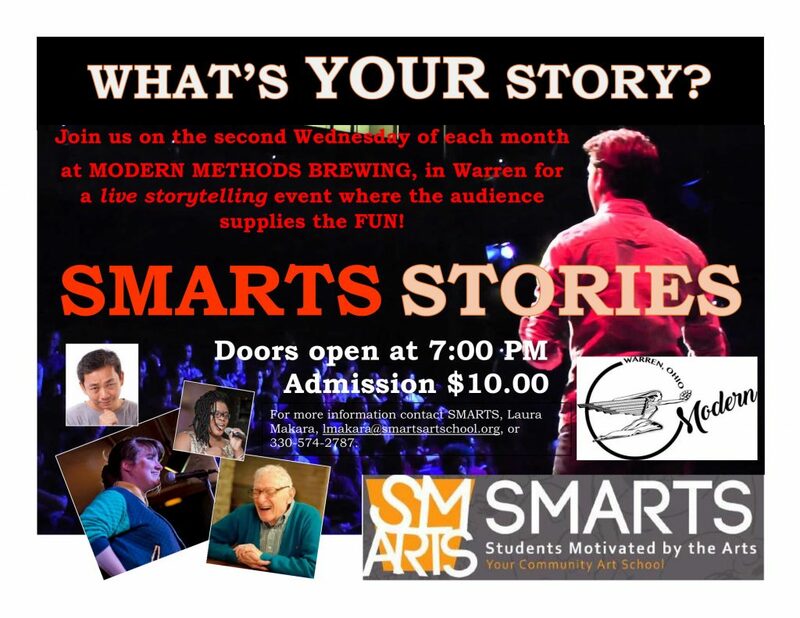 Plan to attend SMARTS Stories a monthly, real life storytelling event hosted by Modern Methods Brewing Co., in Warren. Becky Keck, President of SMARTS, Students Motivated by the Arts, is announcing this unique new adult program called “SMARTS Stories” to connect storytellers with live audiences. All the while enjoying a pint of locally brewed craft beer. However, Schilling cautions that this is not the same as a stand-up comedy routine. All material performed must be from your own experience and without notes. No memorized scenes from plays or prose fiction permitted. Subject matter should not be intended to denigrate any group and performers should avoid profanity. All participants must be adults over the age of 18. Modern Methods Brewery is located at 125 Dave Grohl Alley in Warren, Ohio. Doors will open at 7:00 PM for this private event which will take place on the second Wednesday of each month beginning on November 14. Admission is $10 at the door. Proceeds will benefit SMARTS, your Community Art School. Names of willing performers will be drawn from a hat and storytellers will be limited to 5 minutes. The audience will help select a winner each month. Winners will be invited back to an encore performance in the spring. For more information about SMARTS Stories contact Laura Makara, SMARTS Staff Administrator, 330-574-2787, lmakara@smartsartschool.org. SMARTS community art school, located in Youngstown’s Ohio One Building, provides access and early training in the arts for our region’s PK-12 youth with a focus on underserved populations. SMARTS engages public and private organizations, schools and artists in cooperative projects designed to enrich our community, promote student achievement, inspire self-discovery and impact cultural and academic literacy through fine and performing arts. SMARTS, Ohio One, 25 E Boardman St, First Floor, Youngstown, OH 44503, www.SmartsArtSchool.org.